All 10 players from Bourges were on the score sheet in this LFB match as they overpowered Basket Landes in a one-sided game. However both sides had a good day from beyond the arc as they combined for 17-of-35. Comments from Céline Dumerc will be found after the match report. Bourges got quickly into their stride and opened the scoring with Ana Lelas. They dominated the game in all sectors druing the first four minutes to lead (8-0). Olivier Lafargue, the head coach from Basket Landes, had no option but to call a time-out. 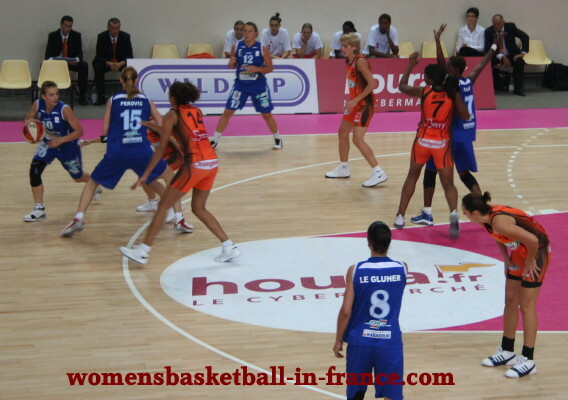 Binetta Diouf scored the historical first points for Basket Landes with 4:03 to play in the first period. However Bourges had already scored 11 points and continued to dominate with just about every player scoring. They closed the first quarter (20-7) thanks to a period-ending-buzzer three-point shot by Katarina Manic. Bourges continued to control the pace of the game with Céline Dumerc running the show. She was everywhere with 1 block, 2 assists, 1 three-pointer and 2 points in just six minutes as Bourges went 15 points clear (35-20). With Dumerc having a break on the bench up stepped Cathy Melain to run the floor. She gave the impression she was going coast to coast before delivering a perfect pass for Lelas to hit a three-pointer. Although Basket Landes were completely outclassed during the first period they did not give up and tried to find a way back into the game. 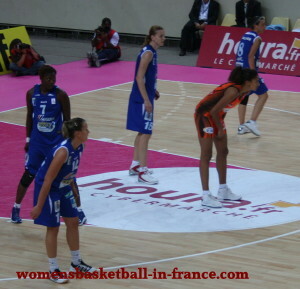 Naignouma Coulibaly, who was in the starting five for Basket Landes, played only 90 seconds in the first quarter as she picked up 2 quick fouls. When she came back late in the second period she helped her team to score. Manic for Bourges hit a three-pointer and thought she would be the last to score in the first half. However Ekaterina Dimitrova had enough time to hit a trey for Basket Landes. Bourges went into the locker room leading (45-23). Marion Laborde got Basket Landes on their way in the second half as she hit a three-pointer from the top of the arc. The next few minutes showed both sides exchanging three-pointers. Yet Bourges stretched their advantage slightly (55-31). Dimitrova was causing Bourges all kinds of problems and with Coulibaly free, Pierre Vincent, Bourges' head coach, decided with just over two minutes to play to take a time-out (57-35). Bourges went into the final period with over 20 points ahead (58-36). Melain opened the final period with a three-point jump shot from the corner. This action was quickly followed with Carine Paul scoring from the land of many. Melain completed the 8-0 run with a lay-up (66-36) to increase the lead. Dimitrova put an end to the run with a shot from down-town and Laborde added another trey as this was the only way to break down the Bourges defense. Nora Bujdoso scored with 6:17 left to play from the free-throw line to add her name to the scoresheet as all the other Bourges players had already scored. The two sides continued to trade three-pointers for the rest of the period (77-44) with Bourges not allowing the advantage to drop. Bourges went on to win (83-51) as Miyem hit a game-ending trey. Céline Dumerc explains in French that the team still has work to do to get everything in order. She is confident though that once they get back into it, it should be okay.